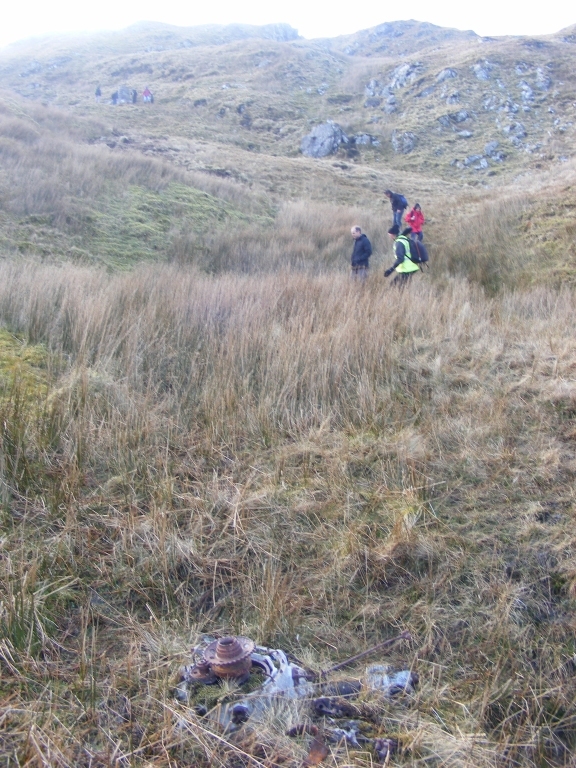 Two short months before the end of the war, the second last fatal crash of the European war took place on a lonely hill side in County Donegal. The aircraft had been observed by the Gardai at Killybegs flying overhead, in a northerly direction, at low altitude and using a searchlight. This sighting was sometime after 02:00 hours on 14 March 1945. The Irish army subsequently reported it having crashed at 02:15 or 02:55. 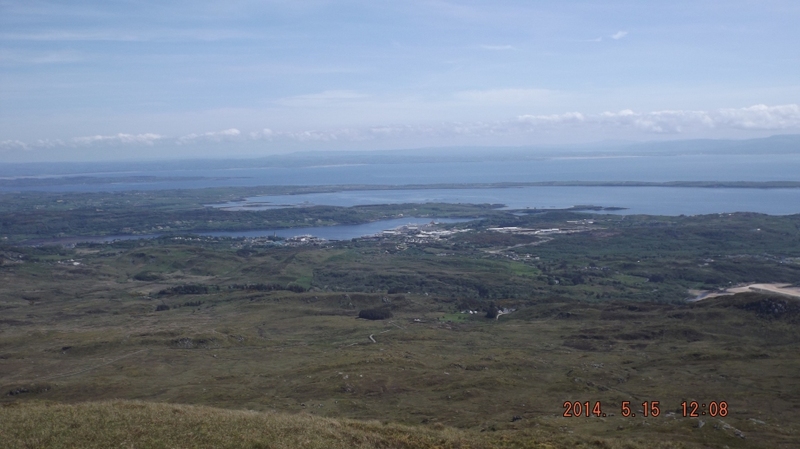 The location of the crash was in early reports described as Clane on top of Fintra Mountain. The first people to respond to the crash were members of the local police along with members of the Local Security Force (LSF) and the Local Defence Force (LDF), who reported getting to the crash site at 05:30 in the morning, the wreckage being found to be still burning. They had met one local man, George Morrow, from Fintra, that a plane had flown over him very low down near his house. Getting out of bed to look, he saw two flashes on the mountain nearby. A military party from Finner Camp also made it to the scene at an early stage after the crash. 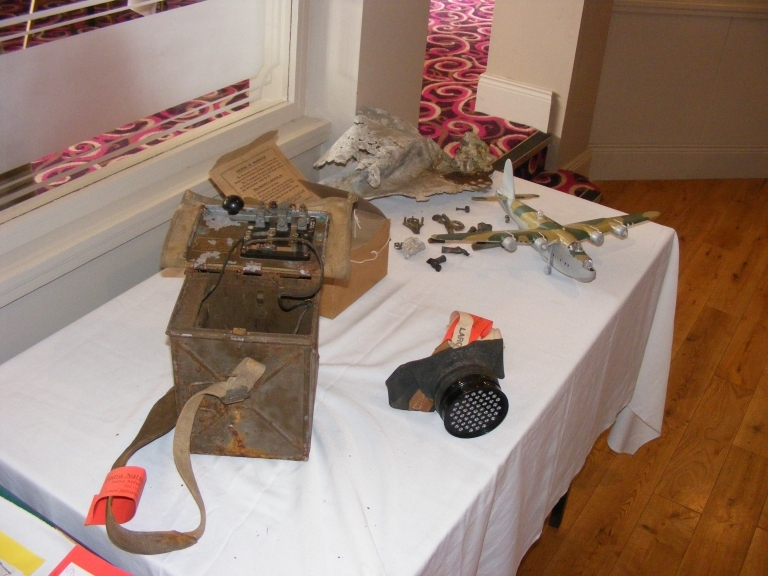 Early the next morning arrangements were made for members of the Irish Army Ordnance Corps to attend the scene and make safe some live weapons that had not been destroyed in the crash. At this early stage it was determined that there were no survivors at the crash site. The members of the Ordnance Corps arrived that afternoon and promptly dealt with the two unexploded depth charges and the hundreds of rounds of machine gun bullets. Earlier in the morning the members of the Irish Army Medical Service from Finner Camp set about the sad task of recovering the remains of the dead crew men. The remains were taken to Finner Camp where they were placed in Coffins and assigned death certificates by a local doctor. Minutes of communications with the RAF and UK government in the Irish Army file show that the name and service numbers of the airmen were provided to the Irish authorities to assist in the identification process. The dead airmen along with whatever personal items as were found, were handed over at the Beleek border post at 16:00 hours on the 15th March. The Irish Army left the site as there was nothing left of the aircraft that could be salvaged. To this day, the engines of the aircraft along with scattered metal structure litter the crash site, a testament to that mornings terrible events. 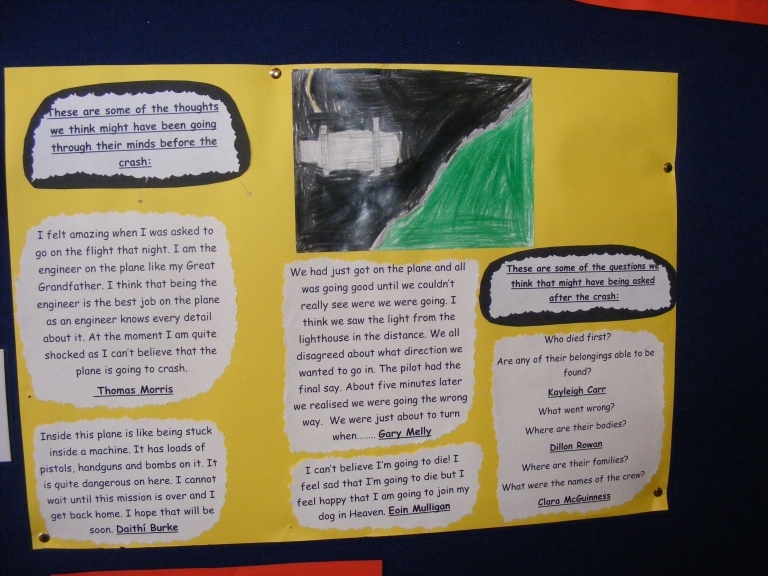 These images were supplied by a kind visitor to the website and the crash site named Leslie. The remains of the 12 men were prepared for burial and some idea of the timing can be gathered from the Australian National Archives file of F/Lt Garrard. John Garrard's wife was informed that he was to be laid to rest in Irvinestown Cemetery, Fermanagh on the 21st March, 1945. On the 21st of March 1945, six members of ML743's crew were buried in Irvinestown in a collective grave; F/O Cave, F/Sgt Davison, F/Sgt Frith, F/Lt Hatton, F/Lt Howkins and F/Sgt Kennedy. P/O Becker and F/Lt Garrard were identified and are buried in individual grave plots, Becker in the same cemetery with Garrard buried in the nearby Catholic cemetery. The four remaining men were returned to their native areas in the United Kingdom for burial. David Twist was returned to his family in Llanfair Caereinion in Wales. James McAvoy was buried in St Peters Catholic Cemetery, Glasgow. F/Sgt Ford was buried in Taunton and F/Sgt Robinson in Hucknall cemetery. F/Lt Hatton came from Skegness in Lincolnshire. He was the son of Minnie F and Richard G Hatton. Son of Richard and Elizabeth Garrard; husband of Dorothy Mabel Garrard, of Fairfield, Victoria, Australia. If you might be a friend or relative of any of the men above and if you have a nice portrait image of any of the men above, I would be honoured if you could send a copy by email or other means and I will add it in. If by any chance you have any one of the men in a group photo it might be this crew and I would love to have all the faces at once. Aircraft serial number ML743 was a Shorts Sunderland Mk III, powered by four Bristol Pegasus XVIII engines and had only joined 201 Squadron in October 1944. 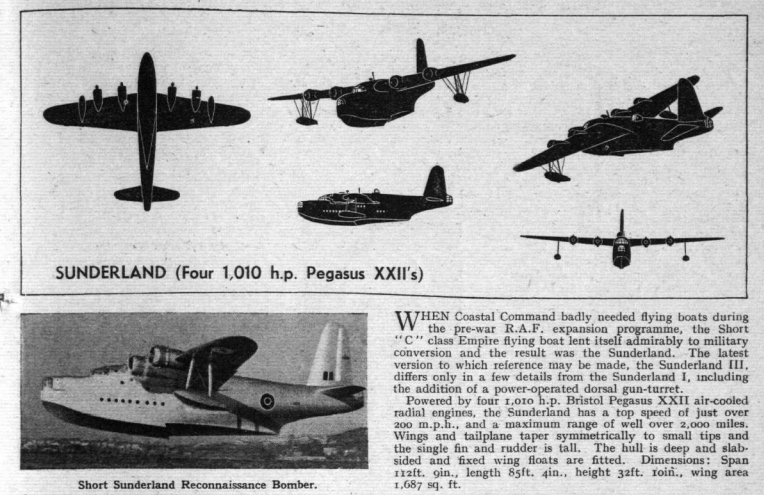 The following contemporary specification was published by the Flight magazine during 1943. 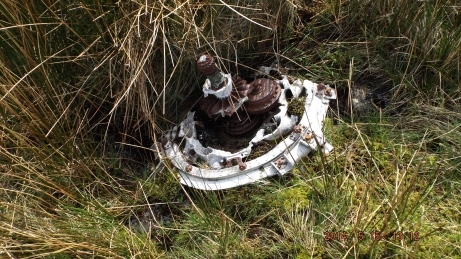 The crash of ML743 was the subject of investigation by the RAF. No mechanical investigation is evident from the various reports available today including RAF Form 412 'Court of Inquiry or Investigation' and Form 765 'Report on Flying Accident or Forced Landing not Attributable to Enemy Action'. ML743 took off at 02:03 that night and was only half an hour into the patrol, flying from Lough Erne in County Fermanagh where she was based with the RAF's 201 Squadron. 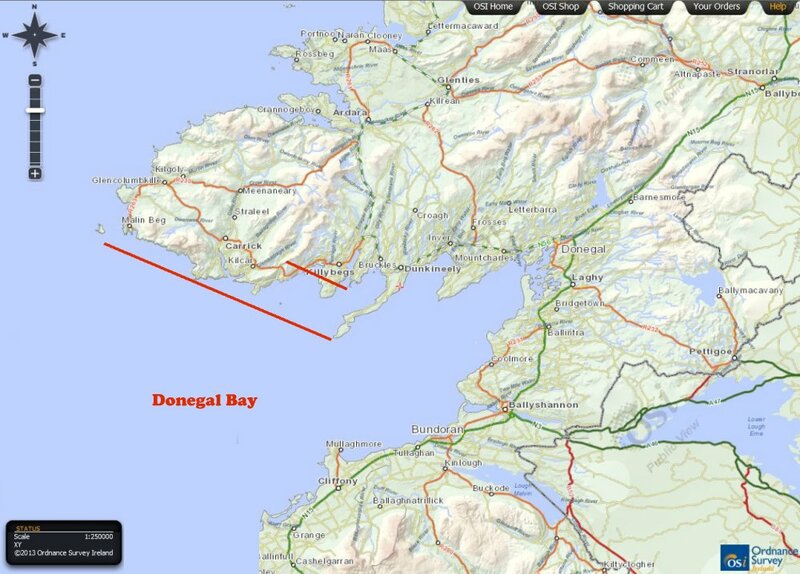 Her intended path was to fly out along the aerial corridor across neutral Irish territory, the famous 'Donegal Corridor', and out into Donegal Bay and thence to the North Atlantic. The mission that night was to fly an anti U-Boat patrol. The investigations recorded in part: "(a) The aircraft left Lough Erne on a very dark night, cloud base around 1000' carrying full ops load which included 2050 gallons of petrol. After Flying Control had acknowledged the "airborne" call over R/T nothing further was heard from the aircraft by either R/T or W/T. Witnesses in Killybegs saw the aircraft approaching from a South Easterly direction, with navigation, and apparently landing lights on. 2nd witness saw a/c alter course, still showing Nav. and landing light, and within 2 minutes heard the a/c crash. 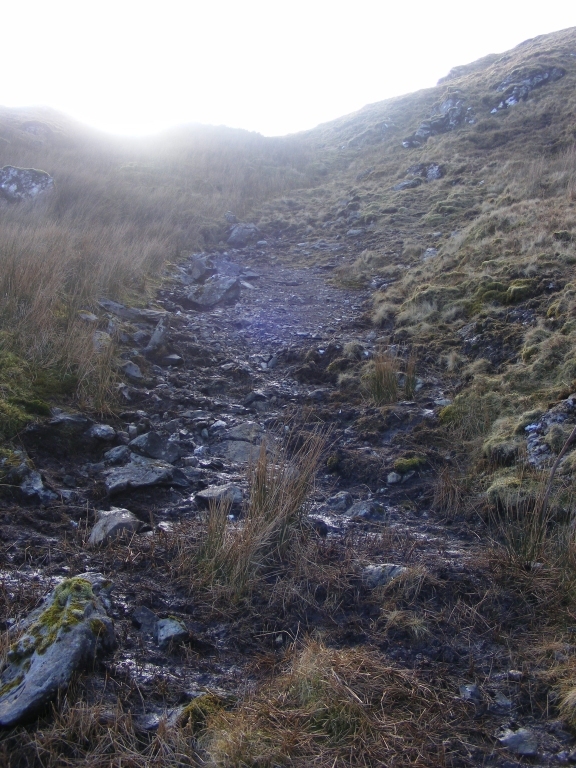 The evidence shows that the mountain top where the crash took place was covered in mist or cloud. The a/c completely disintegrated and was badly burnt, all 12 members of the crew being killed. (b) The cause of the accident must remain obscure. From the evidence it would appear that the aircraft was under the control of the Pilot rather than the Navigator at the time immediately preceding the crash. The use of the landing light seems to indicate that the pilot was trying to pin point himself (or make a forced landing) in the opinion of this court the pilot and navigator did not know where they were - which presupposes that they S.E. was u/s or not being used. The fact that the a/c was on a course of 240 degrees when it crashed may indicate that the pilot realised that he was too far North, and was turning back towards the S.W. The inquiry reports from late April 1945 by the Commanding Officers of RAF 15 Group (AVM L H Slater), Castle Archdale (D M Gordon) and W/Cdr A W Kay from HQ, Coastal Command concluded that while they could not come to a conclusion for the loss of ML743 they felt that the crew had fallen victim to a having taken a short cut of sorts on route to Donegal Bay. Recommendations were made that further standard flight paths needed to be arranged for crews flying on these routes. The Operations Record Book (ORB), AIR27/1178 and 1179 from the UK National Archives allows us to look at the operational sorties carried out by the men who lost their lives on Sunderland ML743. 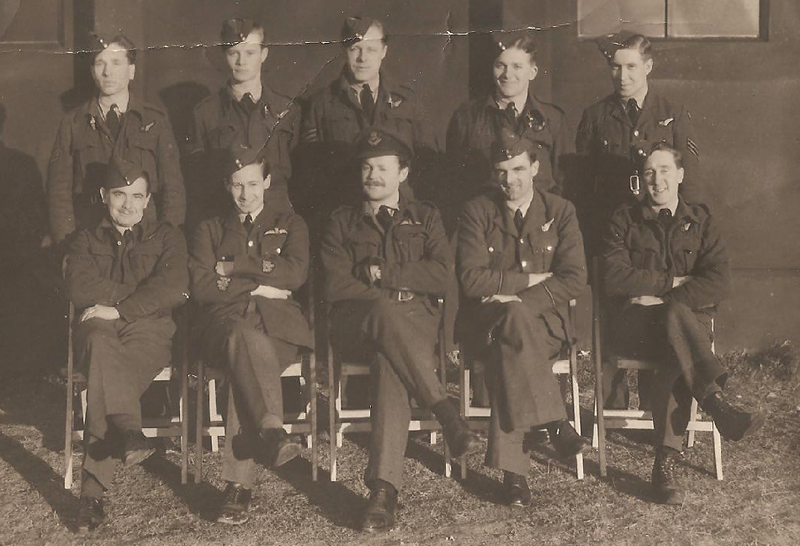 Starting in the summer of 1943, the names of all 12 men were identified among the patrol records and it was found that the men arrived on the squadron at various times during that period and only a few of them flew as regular crew at any one time. 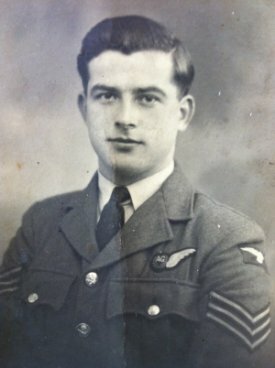 Denis Hatton when he did start his operational career with the squadron flew with a number of the officers and airmen on a very regular basis in the winter of 1944 but later around the time of the crash he was more likely to be found with a few new airmen among his crew. Sadly, this was the first and only time that John Garrard flew with Denis Hatton and these crew members and it seems that this was the very first operational mission undertaken by James McAvoy with 201 Squadron. 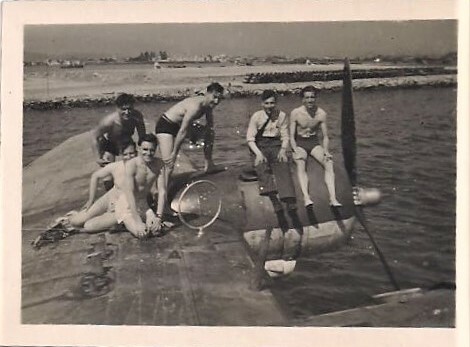 The twelve man crew of Sunderland ML743 on the 14th of March 1945 consisted of men who had both flown together in 201 Squadron for some months together or who were on their first flight with this crew. 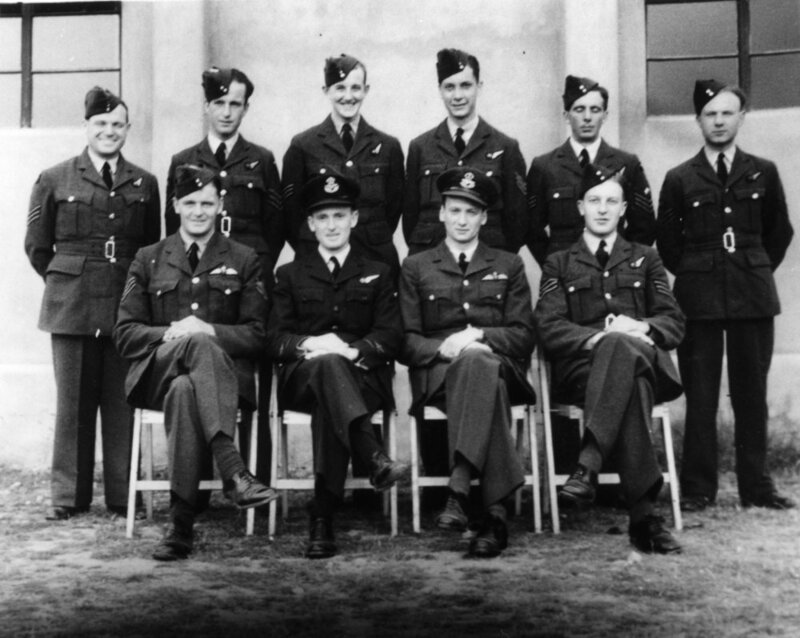 The Operations Record Book (ORB) for the Squadron held in the UK National Archives in Kew records the daily flights of the unit and a picture of the men's service can be built up from this. While all airmen are mentioned for flights, it is only the officers whose postings are recorded. The Squadron tended not to have fixed crew compliments, in so much as it can be difficult to find the same crew flying together for prolonged periods of time. New airmen took up positions at various times until the fateful morning when these twelve took off. 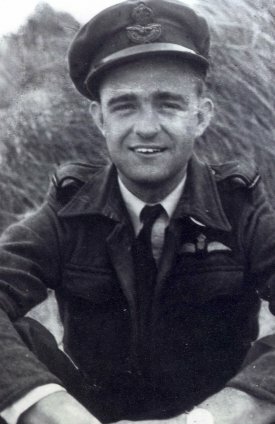 The pilot of the aircraft, Denis Hatton was an experienced pilot at this stage of the war. The investigation reports record him having a total of 705 flying hours on all aircraft types at the time of his death. He had trained at the US Navy Air Station at Pensacola, Florida as part of his training, with a posting to 3 (Pilots) Advanced Flying Unit ((P)AFU) upon his return to England. His commission as an officer in the RAF was published in the London Gazette on 6 October 1942. His name appears for the first time in the Squadron ORB in the summary of officer postings for the month of January 1944. 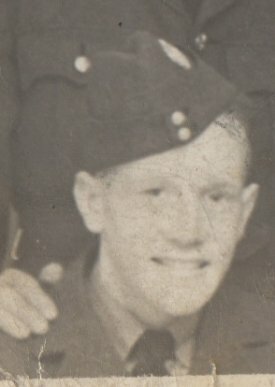 He was immediately posted to RAF Oban in Scotland in February and his name does not appear again until August of 1944, when he was posted back in. 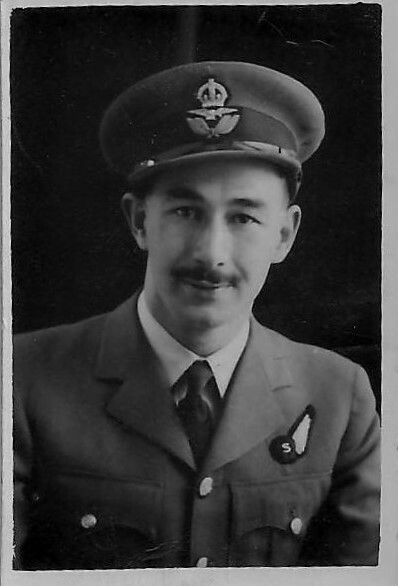 During this time away from 201 Squadron, he was posted to RAF Transport Command and from March to July 1944 he undertook six long range aircraft ferry missions. He first flew Martin Mariner JX129 back long the southern Atlantic route, via Gibraltar, Port Ettienne, ,Bathurst (now Banjul, Gambia), across the Atlantic to Natal and Belem in Brazil, then Trinidad, San Juan in Puerto Rico and finally to Elizabeth City in North Carolina. There he collected a new PBY Catalina and flew it to Montreal, Gander, Reykavik and on to the UK arriving on 19th of May 1944. He then spent the following two months delivering two more unwanted Mariners back to the US, and delivering two more Catalina's to the UK, finally arriving on 26 July 1944. 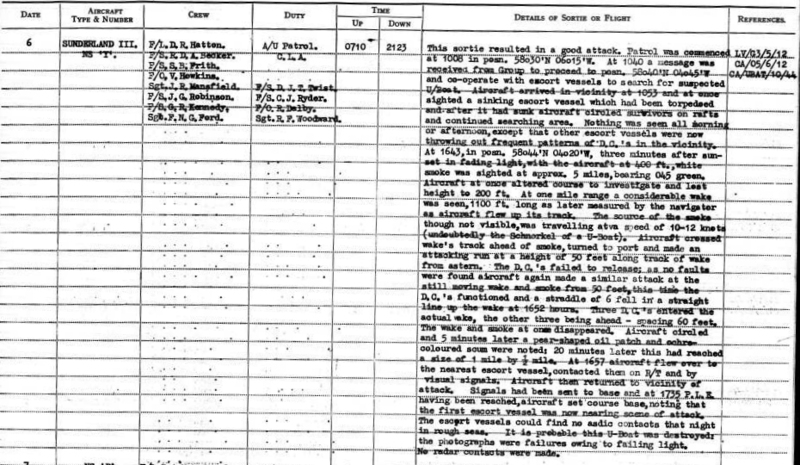 The monthly summary of March 1945 in the 201 Squadron ORB records the admiralty message which congratulated F/Lt Hatton on a 'Grade B' attack on a U-Boat that was likely to have caused it great damage. F/Lt Hatton's name appeared posthumously in June 1945 in a list of RAF officers Mentioned in Dispatches in the London Gazette. In 2013, a letter to the local Skegness newspaper resulted in a kind letter sent by the widow of Denis's brother, Morris. In her letter she sent the photo of Denis displayed above. His mother and father were both employed by the Navy and Marines in Skegness during the war. Robert Becker came from Pouce Coupe, a village on the Alberta - British Columbia border in Canada. He was only 20 years of age at the time of his death, the same age as Kennedy and Ford. He entered the airforce directly from high school. 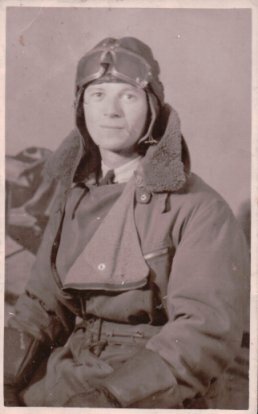 He arrived in the UK in December 1943 and was posted to 14 (P)AFU to get experience of flying in European weather and skies. He was posted to 201 Squadron on 13 June 1944 but was posted to 8 OTU briefly in September of that year. His name first appears in the ORB on this date when he flies a patrol under the command of F/Lt V J Barnes along with Howkins, Twist, Ford, Davison and Robinson. 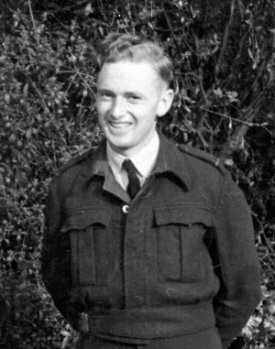 His remaining time with 201 Squadron seen him flying operationally exclusively with Denis Hatton until their death together. His commission as an officer was on process from December 1944 but at the time of his death he was still referred to in official documents as a Warrant Officer (W/O). Robert had at least one brother, George Smyth Becker who died in 1998 in California. It is not yet known if he had other siblings. John Garrard was a School teacher before the war and left two young children and his wife Dorothy when he died. His service file also contains mention of his having received a mention in dispatches. His daughter Patricia very kindly provided the wonderful crew photos displayed below, unfortunately the names of the airmen are only recorded by first name and perhaps nicknames and they don't match up to the ML743 crew names. 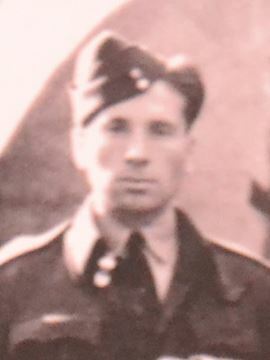 Jack, as he was known with his comrades, arrived on 201 Squadron at the start of August 1943 after a posting to 4 Operational Training Unit (OTU). The 201 Squadron ORB records his first operational flight being on 9th October 1943 with the pilot that was to be his captain for most of his time with the Squadron, L J Wilson, RCAF. Another name that appears in most of the J P Garrard/L J Wilson flights was an airman listed a G E Whipp. The 12 man photo presented below seems thus to show the crew lead by L J 'Jimmy' Wilson. They seem to have flown their last mission together at the end of September 1944, after which Jack does not appear on patrols until at least February 1945, when he flies three missions with different pilots, the last being the fateful flight with Denis Hatton. We would like to understand what the small rectangular badge is on most of the mens breasts, below their trade badge. Front Row: (Unknown pilot), Jack Garrard, Jimmy, Sandy. 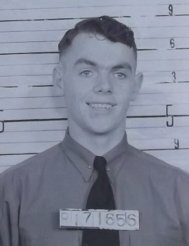 It is thought that the airman named George became an officer between these two photos been taken due to the change in caps, this may be an incorrect assumption. 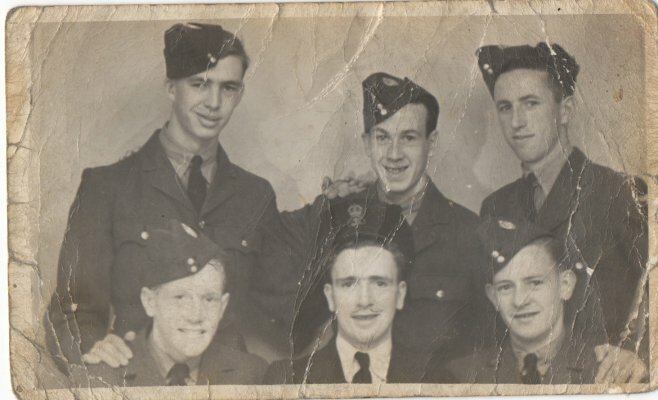 John's daughter was able to identify that the pilot named Don in the photo was an officer named Don Lamb (D C Lamb J29090) a Canadian which makes it likely that the other man with pilots wings named Jimmy was his normal pilot, L J Wilson also Canadian. 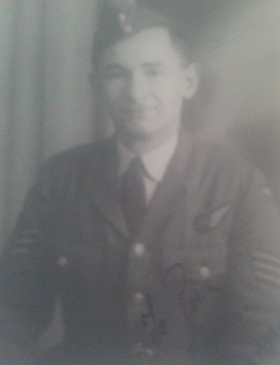 The airman named as Mex or Max on the photo was Charles James Hughes a Flight Engineer/Air Gunner with the Squadron. He was Mexican born British subject and upon joining the RAF carried the shoulder title 'MEXICO. on hsi uniform. It was for this reason that he was named Mex by his friends. His son explained in 2014 how his father always told that he was scheduled to fly that night with Denis Hatton but the station Medical Officer grounded him due to a fever. Vivian Howkins was commissioned an officer in January 1943. 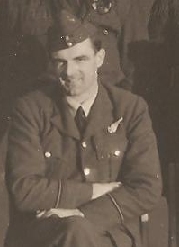 He is noted as being posted into the Squadron in March of 1944 as part of F/O Michael Franklyn MOORE's (130987) crew and his first operational patrols don't appear until May 1st, when he flies with F/Lt E F N Bent. He later flies missions with another officer named Victor Jack Barnes and with F/O Moore before Denis Hatton became is pilot in September 1944 and thereafter only flew with this pilot. His promotion to F/Lt was published only weeks before his death. He married Annie (Nancy) Moody and they had one daughter Vivien (who he never saw) born June 1945. She has sadly passed away in 2009. Vivian was a prewar merchant seaman before the war, in 1930, his name is recorded in archive British Postal Service Appointment books as being a certified Wireless Operator. His name appears on the crew manifest of a small number of vessels between 1931 and 1933. The following group photo was supplied by Vivian's nephew. Its shows another group of airmen, ten in total. At least two are pilots, front center and left center. 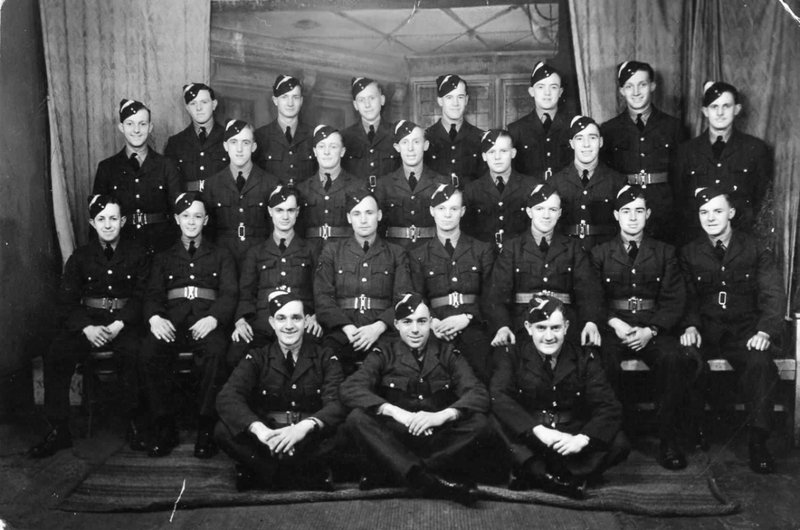 Vivian Howkins is sitting at the front, second from the right. 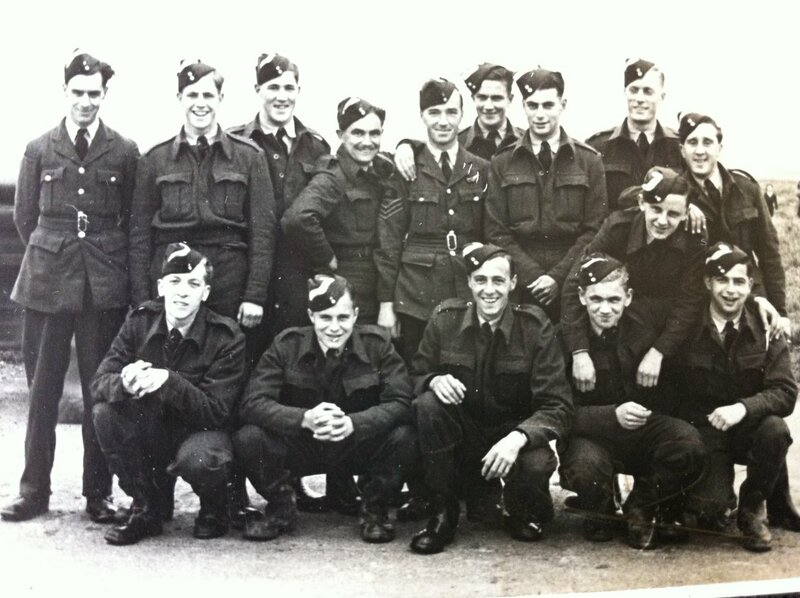 Comparing photos, the airman standing at back, second from left, would appear to be Sgt Robinson. 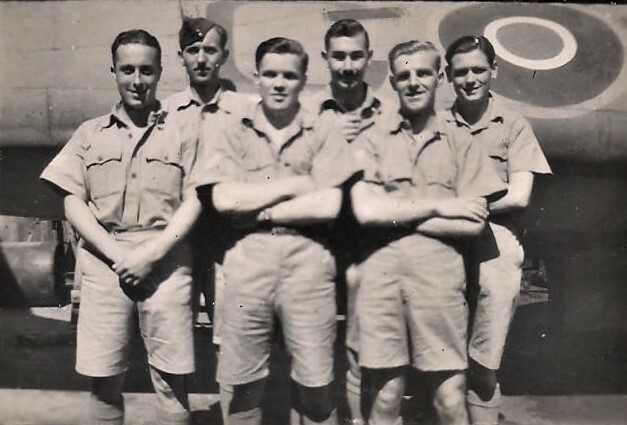 In letters to Garry Pentland, veteran Kenneth R Leese of 201 Squadron seems to explain that this photo shows the 10 men who joined 201 Squadron from 4 (Coastal) Operational Training Unit, namely, Back Row, left to Right: N Davison, J G Robinson, J R Mansfield (? ), D J T Twist, K R Leese (? ); Front row, Left to right: R R Hayes-James, W/O J P Elliott (? ), M F Moore, V Howkins, Sgt Gibson (?). David Twist appears for the first time in the ORB on the 4th of May 1944 along with Davison. He was a regular crew man under pilots Barnes, Moore and Hatton until his death. He was remembered by his local village in 2005 when the local British Legion had the Bluestacks Ramblers walking group leave a wreath at the crash site in his honour. He was born in 1923 in Pewsey, Wilshire district. His mother, Agnes Mary (Nee Cottle, Nee Griffen) passed away in 1963, with his father passing away in 1974. He had two half brothers Walter and Albert Griffen. Their family have very kindly retained the memory of David from his now deceased parents and brothers. One of his neices was only a few months old when he died and she recalls that David was so proud of his neices though he got to meet them only once. His neice and her daughter were so very kind in providing all the images they kept of David and these are presented below. It is worth noting the photo of him in flying gear beside a Nissan hut, in very similar surroundings to the photo of Norman Davison. 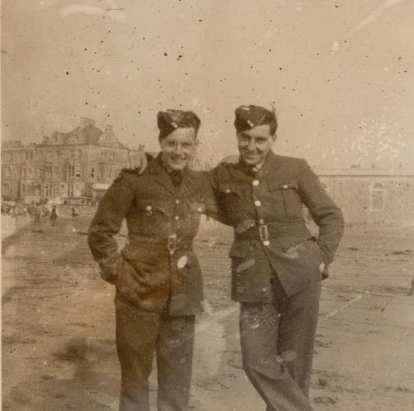 James (left) with a friend photographed in Northern Ireland, does anyone recognise the building, perhaps a sea side town? Edward Norman Cave was born in Rochford District, Essex in 1921. His parents, Edward George Cave (b.1890 Pancras) and Florence Annie Pledger (b.1894 Orsett d1974 Thurrock) had married early the previous year in Orsett. 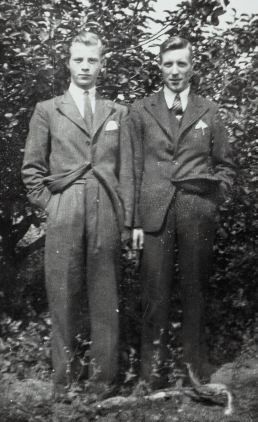 Edward himself married only in the summer of 1944 in Thurrock, Essex to Elsie Polley. Around the same time he was posted into 201 Squadron. Upon joining he was assigned to various crews, flying at least nine missions until the tragedy on March 14th. His commission as an officer was published in the London Gazette on May 30th 1944, being promoted from the rank of Flight Sergeant. 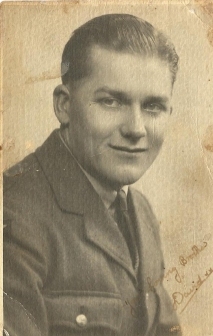 He may have enlisted as early as 1941 and it is believed that prior to being with 201 Squadron he flew on Catalina flying boats with 202 Squadron based in Gibraltar. A Sgt E N Cave is found in that Squadron throughout the period 5th March thru to the 17th September 1943 under the command of a F/Lt C J Le Couteur RNZAF initially, and later F/Lt C G Fox. 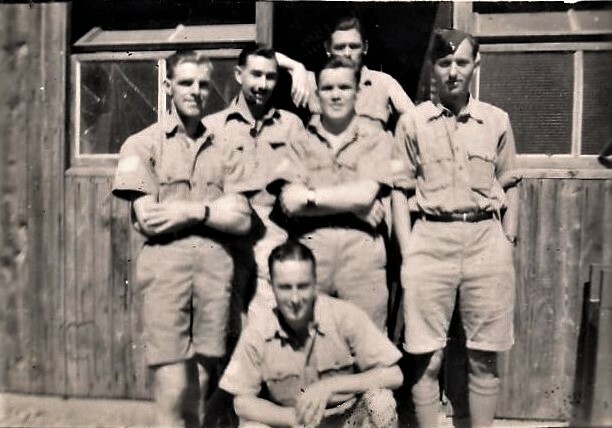 The UK National Archives, AIR78, index to airmen, contains only one name which matches the initials, E N.
The following photos are thought to show Edward during his time posted with 202 Squadron in Gibraltar. 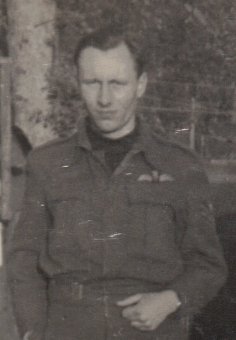 James Robinson was another of the most regular airmen to fly with Denis Hatton and his name appears on operational sorties in the ORB in May and June 1944 along with Ford, Davison and Twist. His photo was provided by his grand neice who passed on the stories that were told by James' brother, her Grand father. 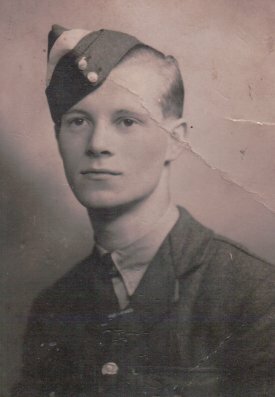 His brother understood that James was a navigator by trade, the available records from the crash of ML743 place him in the role of Air Gunner or Wireless Operator Mechanic. 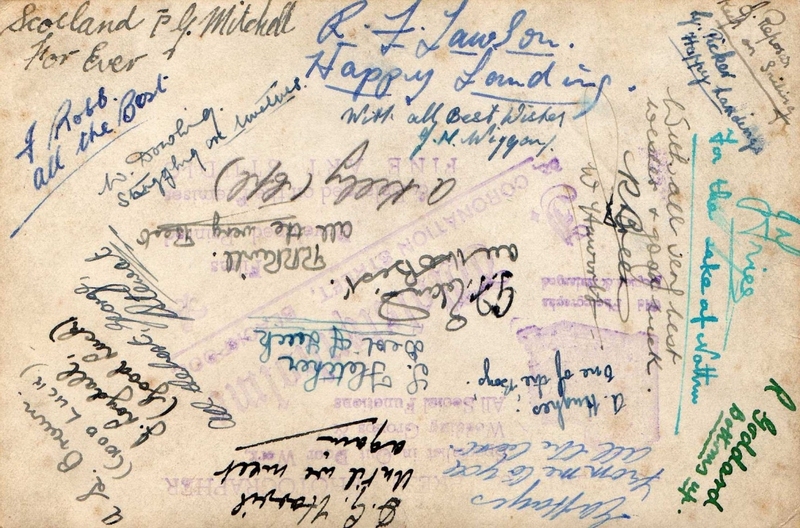 He had written to his brother saying that he had completed his flying time and that he would be home soon. 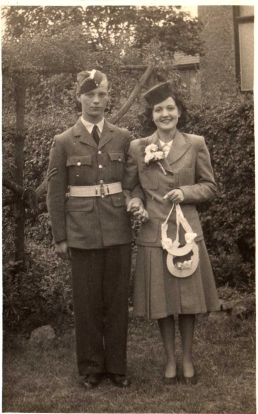 James had married his wife in 1942. 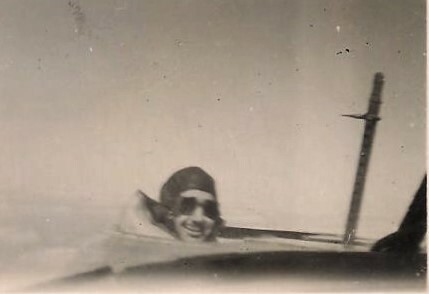 James Robinson in flying gear. James pictured with his wife Doreen James with his older brother John. James was known by his second name, George within the family. 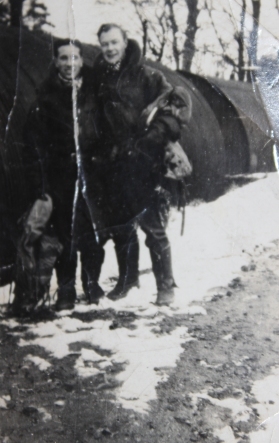 His nephew said: "My father, John Robinson was serving with the 63rd Antitank regiment attached to the British 11th armoured division in 1944, the year I was born. He was part of the D-Day invasion of Normandy, through France, Belgium , Netherlands and crossed into Germany. During the start of the new year of 1945 dad had received a letter from George to say he had completed his flying missions and would be home soon. The 63rd antitank regiment was the first to arrive at Bergen-Belson concentration camp on April 15th 1945,the first camp to be liberated, this is around the time when my dad got the news George had been killed. He told us, that his senior officer would not give him leave to attend the funeral, leaving him with such a sense of anger. To us knowing the story of his childhood, losing his mother and sister when he was just 9 years old, and bringing up George just aged 3,they were close. George's grave is in Hucknall cemetery , my brothers and I have visited the grave my times but, to our knowledge our father never has, "strange", why we do not know." Taken by a photographer names Wolstenholm based at 33 Coronation Street, Blackpool. George Kennedy spent most of his flying time with 201 Squadron flying with a crew led by W/O R L Smith up to October 1944 after which he joined Denis Hatton and the other regular crew members. George Kennedy has proved difficult to trace in great detail. His parents names are listed by the CWGC as associated with Hanwell, Ealing, Middlesex. Frederick Ford's name first appears in the 201 Squadron ORB around June 1944. There is confusion in finding his name in the ORB as there was another airman named C V Ford in the Squadron at this time. He flew regularly with Denis Hatton as well as Barnes and Moore. 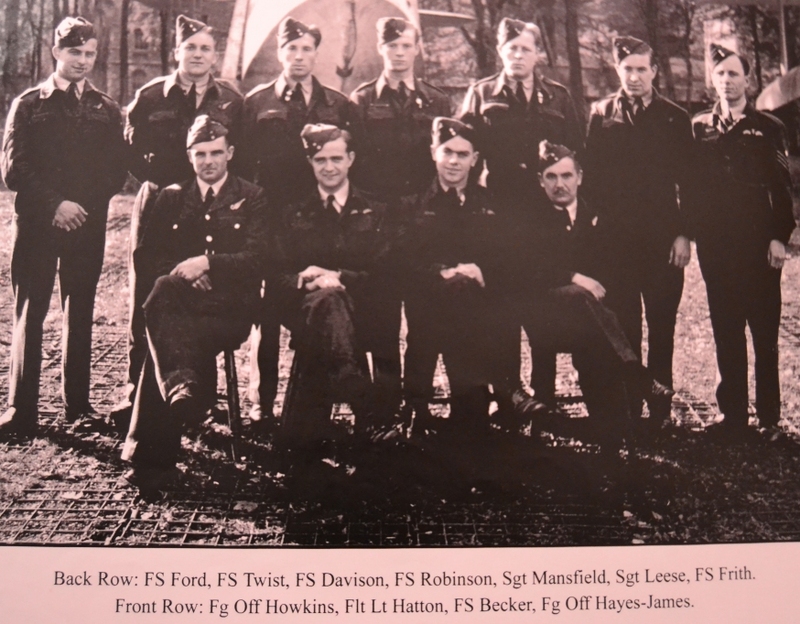 The ORB suggests that the other airman, C V Ford also flew with Hatton during the winter of 1944. His nephew Michael Ford, a BBC journalist, wrote about his visit to Donegal and trip to the crash site in his book, Song of the Nightingale. The image above was supplied by M Ford and includes the inscription " My squad after we had finished digging potatoes Pembrey No 1 AGS Sept 1943". 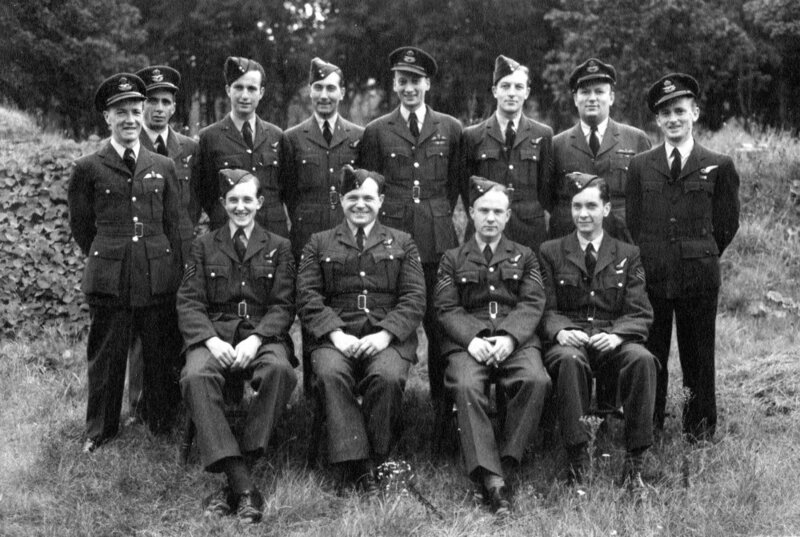 Fred Ford is far right bottom row and it seems likely that Ronald Hayes-James is the airman standing fourth from the left. 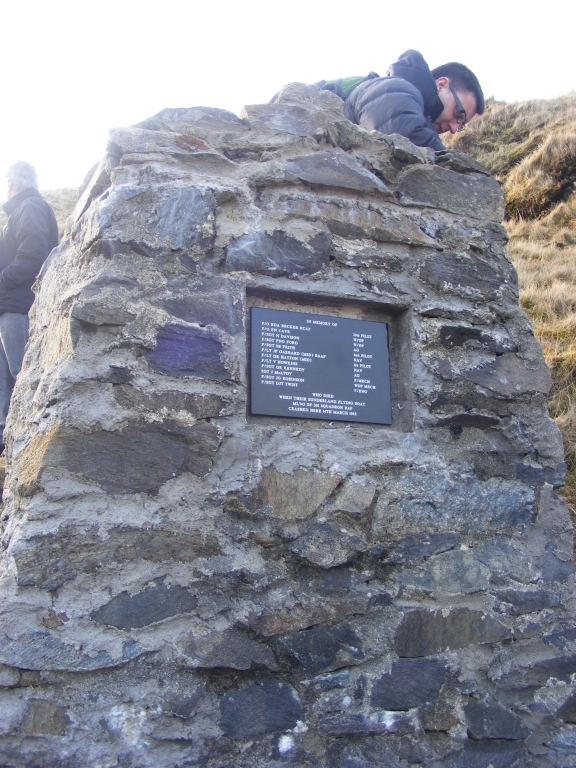 In January 1995 a memorial plaque was raised on the mountain side in memory of this crew. 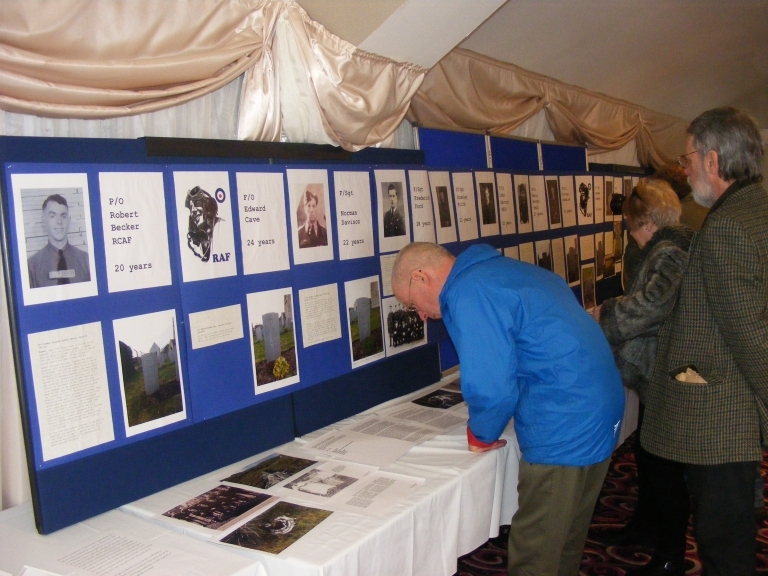 The memorial was arranged by Mr Garry Pentland of Gortin, County Tyrone. 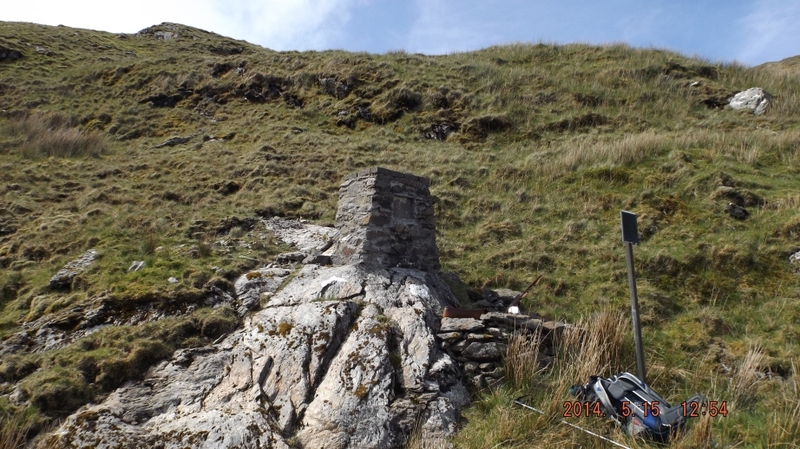 Garry Pentland passed away in 2013 before a new stone cairn memorial could be completed. A kind visitor to the website provided some photographs of the plaque and behind it the new memorial being prepared. The above image shows the old crash memorial mounted on a pole with the new memorial cairn in progress behind it. 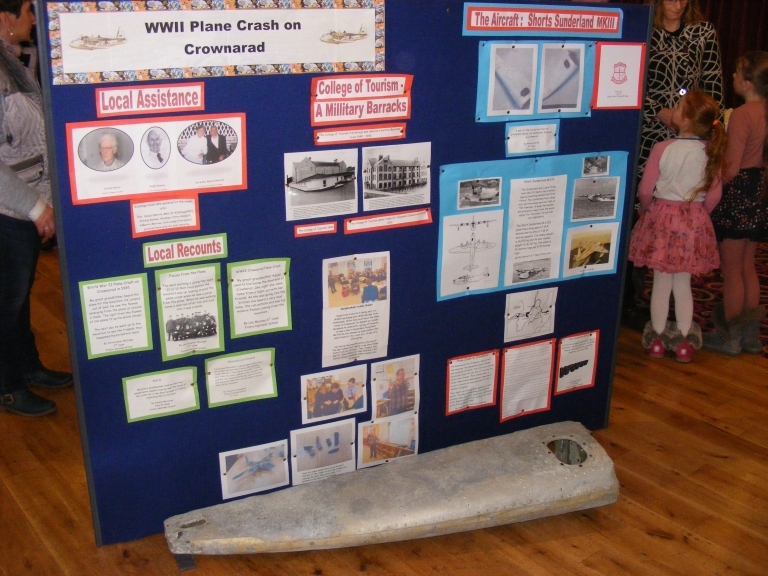 On the 14th of March 2015, 70 years to the day of the crash, the people of Killybegs and surrounding area and further afield, gathered at the Clock Tower Restaurant at Fintra. 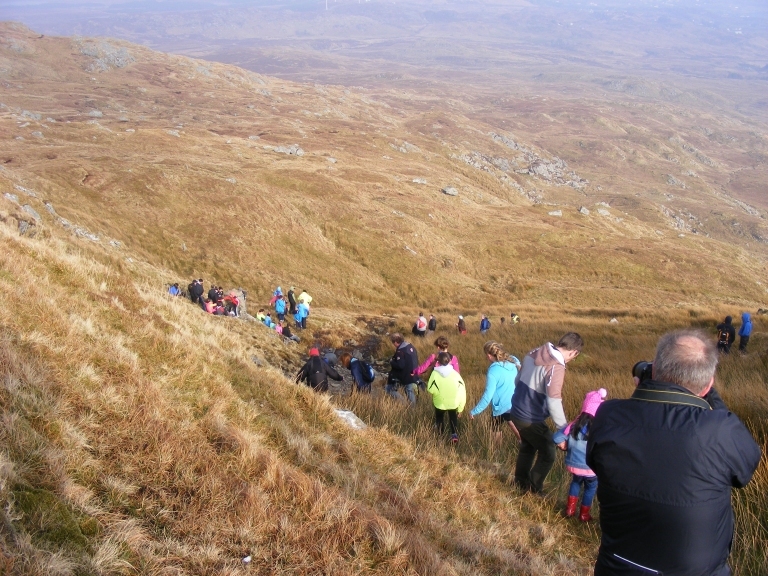 The organisers had worked closely with all the local schools, including Fintra National School which sits at the foot of the mountain. 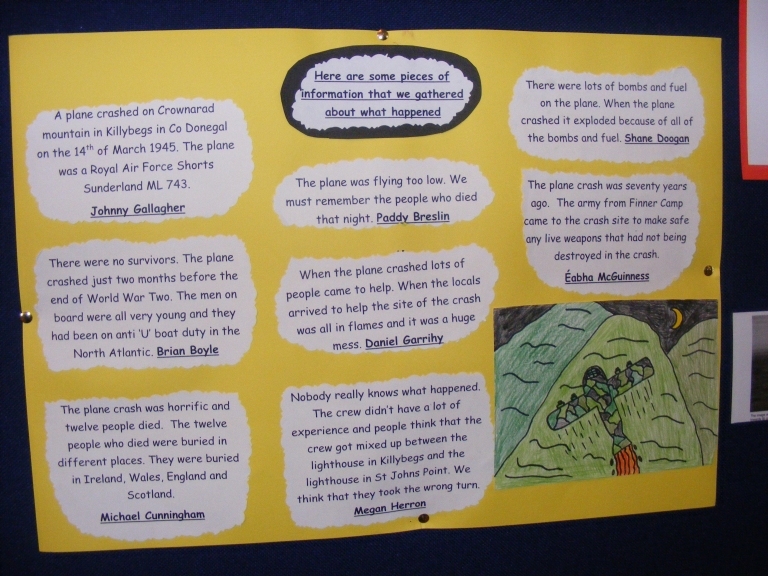 The children had produced the most fabulous collection of drawings and posters about the crash, from what they had learned from their teachers and local historians who visited the schools in the days leading up to the event. At 12 o'clock, the gathering kicked off with local man Willie Mackie introducing the event and explaining some of the background. The intrepid RoseMary Murphy spoke next about the work that had been done researching and building the cairn and about the men who died in the crash. She then passed the mic to local man Tony (surname escapes me just now!) 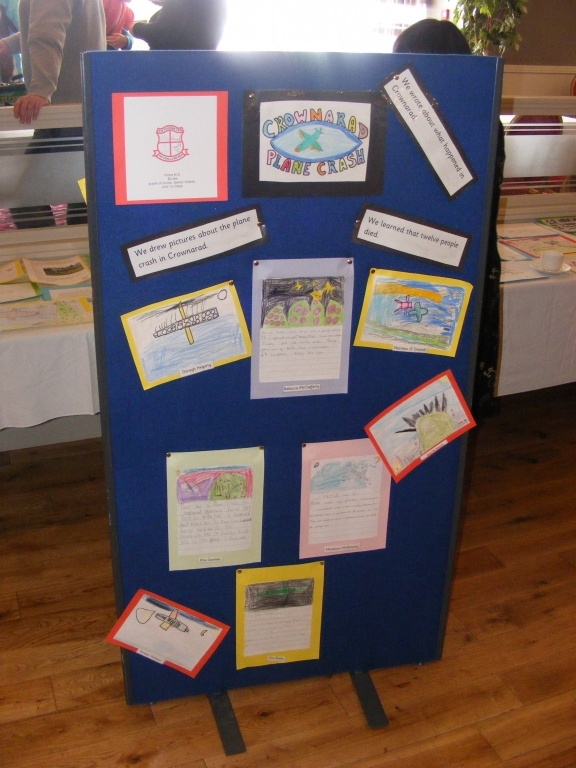 who explained some of the local history and described the visits to schools that were done in preparation. The Canon John Deane, the local Church of Ireland rector, lead the assembled crowd in a short prayer service. This was followed by a most poignant part of the day. Four of the children from Fintra School each read out three names and ages of the crew members from ML743, their small voices carrying across the silenced room. After this, the Bonnar School of Dancing provided a demonstration of Irish dancing and those attending were able to partake of refreshments. In attendance were relatives of Freddie Ford, Jack Garrard and James McAvoy. Members of F/Lt Garrard’s family had flown in specially from Australia to attend. At two o’clock, the first of three buses began to shuttle people to the start point at the base of the mountain. So for a few hours, I bade farewell to my daughter Agnes, 4 months old, and my wife Emer and joined the large group of people who walked to the site on Saturday. At least as many as 40 people walked to the crash site and it may have been as many as 90. Some of the crowd can be seen in the photo below. The weather could not have been better, given the recent conditions. There was a nice sun in the sky, a little hazy; one could just see the line of St Johns Point on the horizon from the mountain top. After an hour or so hiking, over wet bog the group gathered at the site of the crash and of the new memorial prepared by the late Garry Pentland and completed of late by his family and friends. Canon Deane again led the group in a prayer service followed by Children again reading aloud the names and ages of the 12 men. Mike Ford then spoke for a few moments about his family’s experience of the loss of a loved one on Sunderland ML743, 70 years before. Members then from the McAvoy (McGlone) and Garrard (Salkin) families spoke of their delight at having been able to attend and their thanks to those who had arranged the memorial. Mike Ford and Frank McGlone then unveiled the new permanent stone memorial adjacent to the plate that was raised by Garry Pentland with friends in 1995 on the 50th Anniversary of the crash. The next photo here shows the slope just above the memorial. 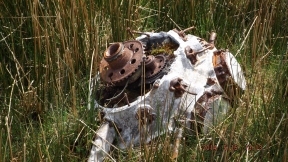 Little grows here and one can very quickly find signs of the aircraft crash here in the form of a great many solidified blobs of metal, rusted nuts and bolts, peices of glass and perspex, along with wiring and other fragments. On the slope down from the site, the direction the visitors took on the way home from the unveiling, one finds the aircraft engines lying among the heather and rushes. This photo shows the lower of the engines, with the memorial cairn just barely visible in the upper left corner. The image below looks out from the crash site back over Killybegs harbour, the long peninsula in the back ground heading towards St John's Point. 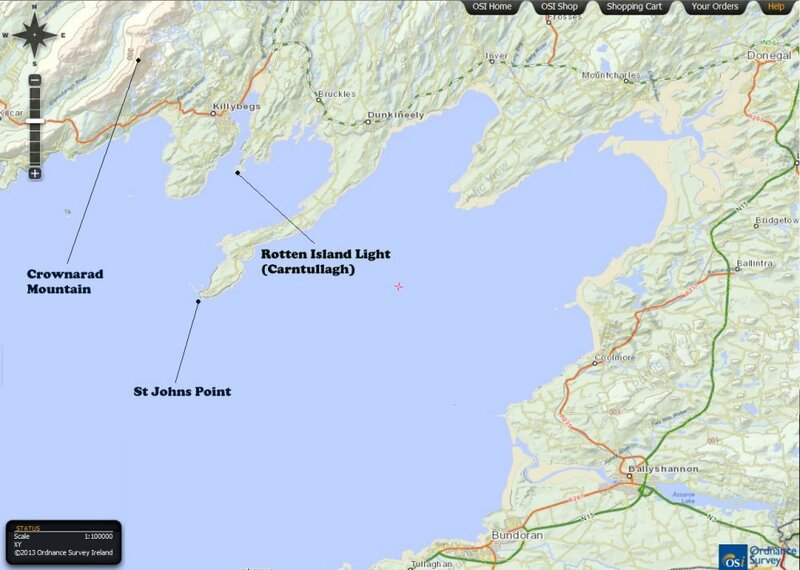 The following maps shows the general area of Donegal Bay, including the towns of Killybegs and Donegal Town. Upper Lough Erne where the Flying boats were based is also seen in this map. This map below shows the area of the crash in greater detail. The RAF investigating officers drew attention to the possibility that the crew mistook Rotten Island light as being St John's Point light and thus flew overland when they though they were over the sea. These two parallel routes are shown on the map above. This was only supposition on the part of the investigation team and cannot be taken to be a proven cause for the crash. Compiled by Dennis Burke, 2016. 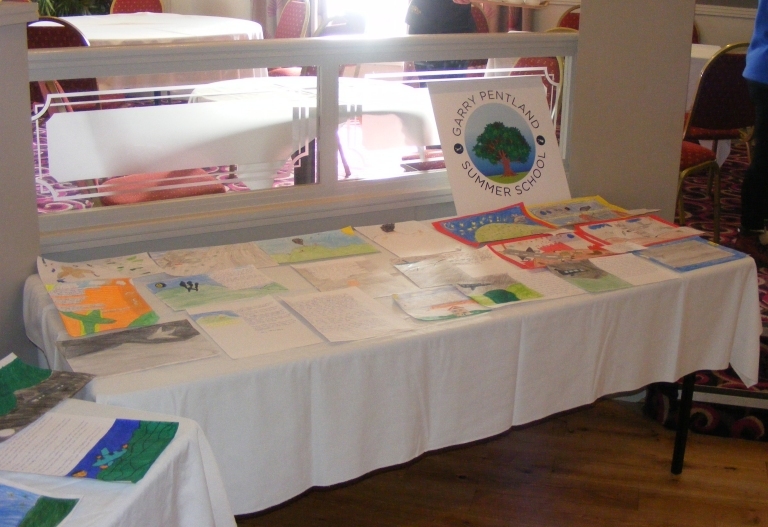 Photos below are from the exibition laid on in the Clock Tower Restauraunt, and largely created by local School children.